I'm a student studying interior design with a love for writing on the side. Pizza lover on a budget? The extortionate prices of Domino's got you down? For a pizza lover like me, I can't afford to be paying out £14.99 or more every time I want a pizza, which is why I thought I'd share with you the best budget pizza I've found so far. I've tried a fair few pizzas in my time and the frozen pizzas, although cheap, just don't seem to cut it for me, which is why I decided to try the Sainsbury's pizza counter. I also know exactly what I want when it comes to pizza. Some say I'm 'fussy', which is why I went for the make your own option. A large pizza with three toppings is £3.50, but each extra topping is 50p extra; so I obviously added extra mozzarella cheese! You also have the option for them to cook it for you too, just like a real takeaway! The end result is shown in the picture included: pepperoni, chillis, cheese and extra mozzarella - all for £4.00. You can't go wrong. 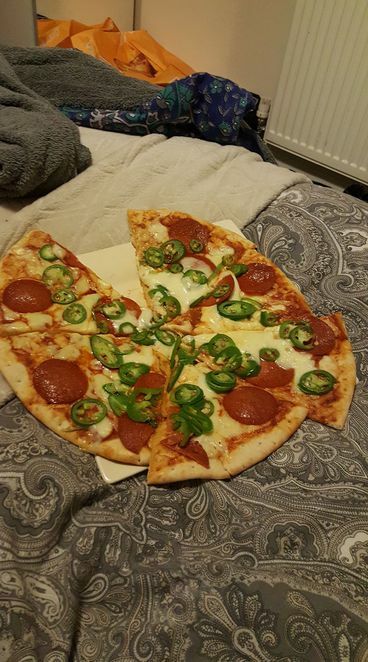 I saved over £10.00 and had a delicious pizza with left-overs for the next day. I only wish I'd found it sooner!